Just rolled over 100K. 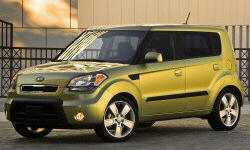 2010 Soul! Have had a slight "idle/hesitation" for a few months. Changed plugs (Iridium), changed plug wires (KIA Parts). Nearest KIA Dealer is geographically inconvenient. Any suggestions for a semi-skilled mechanic? Have you checked for codes? Is this recent problem or a long term one? Have you bought gas in a new place since this has happened? You might add a can or two of Heat or some Seafoam in case there is any water in the gas. Also might run a can of fuel injector cleaner(I use Techron) They might be slightly fouled. Our 2012 has a slight miss at idle also but has only 46,000 miles on it. Also make sure your air filter is not plugged. Although the fuel injection and mass air flow sensor will compensate for a partially plugged one it can only do so much. There are many routine maintenance items that are often over looked. Go through your owners manual and make sure you have been keeping up. Take a good look around under the hood for Vacuum lines damaged worn. Concider replacing primary O2 sensor they wear out and get weak. Use proper octane fuel. Have you noticed a reduction in fuel economy? Thanks. How difficult is it to change out the O2 sensor on this 2010 Soul+ ?